On approach, the layer of cloud is lifting. Metre by metre, the ground is getting closer. A quick judder, a faint screech from the tyres, touchdown. Welcome to Romania, or Sibiu to be precise. The city with a population of 150,000 is the cultural centre of Transylvania – that mythical region in the heart of Romania, which is almost completely surrounded by the Carpathian Mountains and their foothills. Outside in front of the terminal, a very special welcome committee is already waiting: 21 ŠKODA OCTAVIA SCOUTS gleam fantastically in the midday sun as if trying to outshine each other. The paintwork is still as clean as a whistle. But that is about to change. Three days and around 900 kilometres of adventure, mud and dirt await them and their crews. 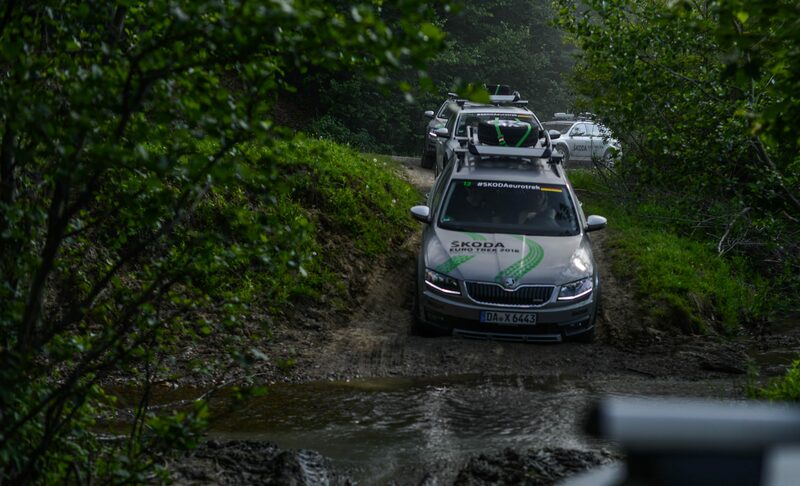 The ŠKODA Euro Trek 2016 leads the 21 two - person teams through some of the wildest mountainous landscapes Europe has to offer – from the starting point in Sibiu, through the Transylvanian valley into deepest Transylvania, and to the Danube Delta on the Black Sea. On the three very beautiful and equally demanding stages, the crews and their vehicles scale the steep mountains of the eastern Carpathians, experience exciting river crossings and overcome numerous challenges. One particular challenge: the route consists largely of dirt roads, muddy trails and rough gravel tracks – ideal terrain for the ŠKODA OCTAVIA SCOUT with a 2.0-litre, top - of - the - range diesel engine and 6 - speed DSG*[A1] . Thanks to its powerful and efficient 135 kW (184 PS) engine, generous ground clearance and innovative all-wheel drive, the versatile off-road estate negotiates difficult gradients and slippery passages with ease, as it will demonstrate many times in the days to come. In case the need arises, the vehicle’s spare wheel and wheel chock are strapped to the roof rack. After all, the ŠKODA Euro Trek is not a walk in the park, but rather a real endurance test. Eerie backdrop: the Euro Trek stops off at Bran Castle in deepest Transylvania where Vlad the Impaler supposedly once lived. Drăculea, aka dracula – a must-see for every horror fan. Ladies and Gentlemen, start your engines. The ŠKODA Euro Trek adventure is beginning. Beyond the city boundary, you catch a first glimpse of Romania’s rugged side: the well-paved streets give way to extremely rough tracks with pizza - sized potholes – filled to the brim with water from the recent downpour. Slalom around the potholes? Not an option. Instead your inner child awakens and, within minutes, the first thick, muddy water droplets trace their way across the bodywork of the elegant estate. The brilliant silver - coloured, metallic paintwork remains clearly recognisable for now. But the trip across Romania has only just begun. Time and time again, the all - wheel - drive vehicles pass old, horse - drawn carts – single - axle wooden carts, fully laden with hay, scrap metal or shopping and pulled by small Panje horses. Old meets new. Although on foreign soil, the teams somehow feel at home: wherever the ŠKODA Euro Trek appears, it is always warmly received by locals. A warm welcome on rough roads – hospitality is of paramount importance in Romania. Nevertheless, you must always keep your eyes on the road, as countless stray dogs, roaming horses and cattle require your full attention. After about two hours, the Euro Trek crosses an old railway viaduct and briefly stops to take in the picturesque panorama: rich - green meadows shimmer deep in the valley and are enthroned by the light - blue sky above. 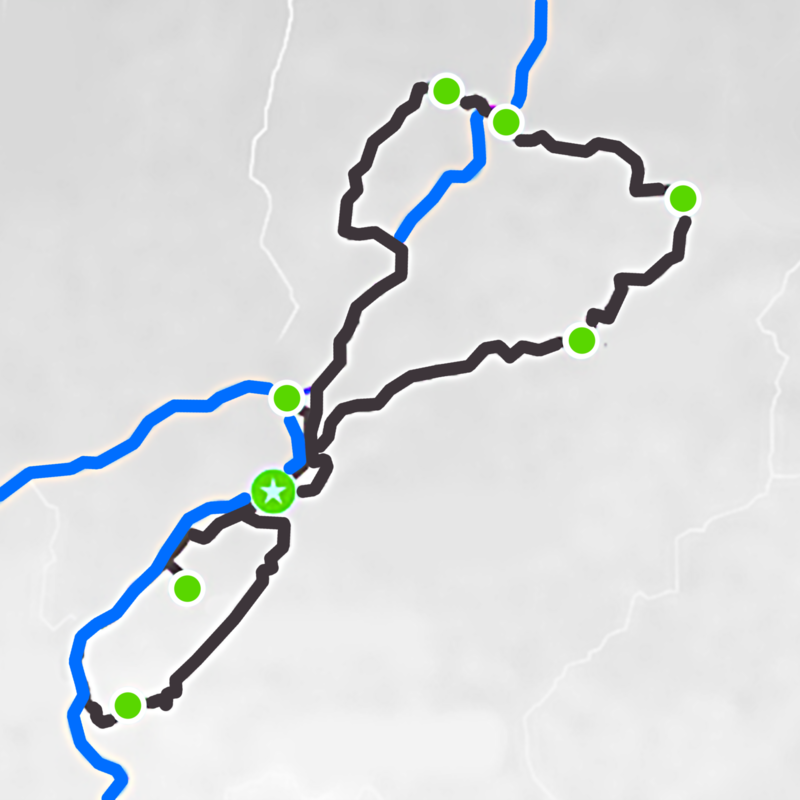 The determined ŠKODA convoy is now heading for that horizon, as the next waypoint is an old agricultural farm below the legendary Bran Castle. An eerily beautiful location in deepest Transylvania, untamed and mysterious at the same time. Not surprising because legend has it that Vlad the Impaler or ‘Drăculea’ used to live here in the 15th century. 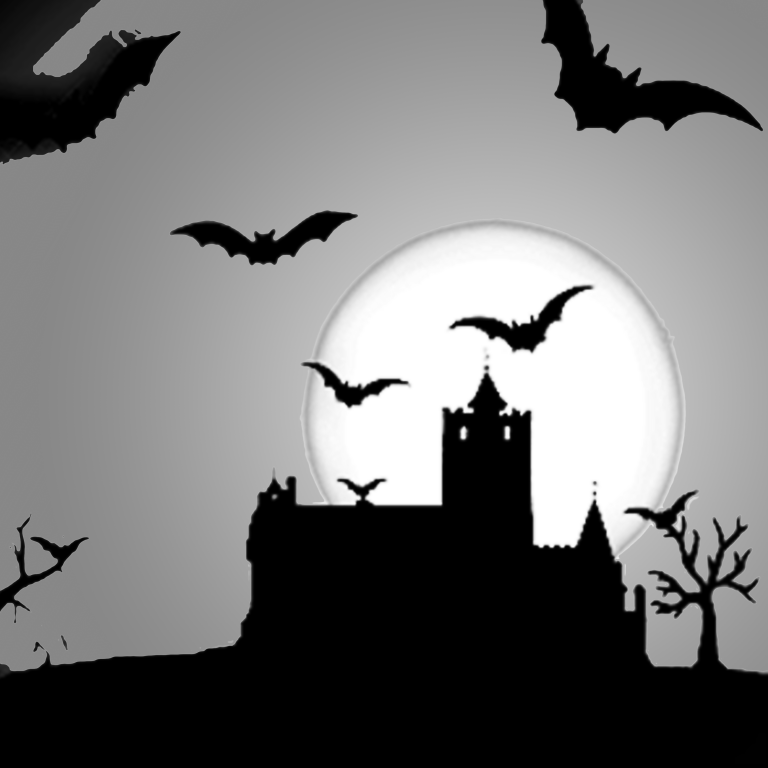 ‘Dracula’s Castle’ is a place of pilgrimage for fans of the famous vampire. It sits in the middle of Europe’s largest, continuously forested area, framed by the Făgăraș mountain range with its nine, snow -capped, two - and - a - half - thousand- metre peaks. A quick glance up at the sky – thankfully there are no bats in sight. Up in the clouds: an old railway viaduct spans the valley near Șinca Nouă amidst the picturesque countryside. The world - famous Transfăgărășan Highway, which is among the most spectacular routes on the planet, is close by. But as you would expect of true off - roaders, the ŠKODA Euro Trek is seeking adventure off the beaten track. The OCTAVIA SCOUTs are thereby leaving the asphalt and following deserted dirt roads. The comfortable estate transforms into a clever scout that skilfully demonstrates its strengths on difficult terrain. The all - rounder has an electronically controlled multi - plate clutch. The system reacts to all possible driving conditions within milliseconds and invariably distributes the power to all four wheels depending on the situation. That provides the OCTAVIA SCOUT with outstanding traction, excellent driving dynamics and great active safety. When driving across dirt tracks, stones and gravel, the underbody protection of the standard Rough-Road package prevents the drivetrain as well as the brake and fuel lines from getting damaged. The dirt road to the next stopover is a relatively steep incline that doesn’t offer much grip on a surface softened by rain. The ŠKODA OCTAVIA SCOUT’s advanced all-wheel drive also overcomes this challenge with ease. Fountains of mud from the climbers in front hail down on bonnet and windscreen. Thanks to the plastic mouldings, which come as standard, the body remains unscathed from the bushes and undergrowth. After several slippery kilometres, the OCTAVIA SCOUT proudly display their new war paint: ‘Off-road Brown’, which you won’t find on any list of features. You have to earn it. Then, the convoy suddenly comes to a seemingly insurmountable hurdle: a river meanders through the picturesque landscape. But that’s not the end of the ŠKODA Euro Trek – thanks to the vehicle‘s ground clearance, which was increased by 40 millimetres, the OCTAVIA SCOUT channels its way confidently through the water. The Wild West begins on the other side: in the middle of the Romanian plain, you suddenly catch sight of American - style covered wagons and a ranch – ‘Maggie’s Ranch’. The American owner of the hotel of the same name has brought a small piece of Pennsylvania to Transylvania. A welcome opportunity for the Euro Trek cowboys to rest after a long day’s riding. 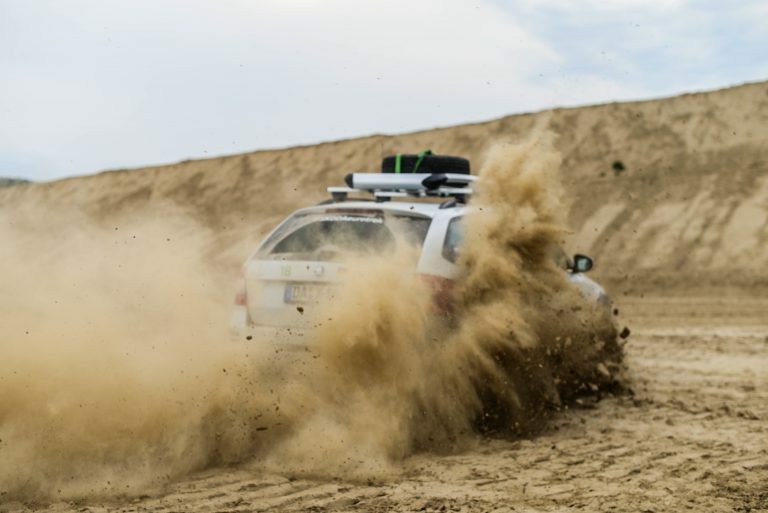 Drift works: on the way to the Danube Delta, the ŠKODA OCTAVIA SCOUT proves its drifting abilities. Sonny boy: whether on asphalt or off-road – the ŠKODA OCTAVIA SCOUT impresses on any terrain with superior driving characteristics and a high level of comfort. The saloon’s Western saddle bar stools with cowhide-covered seats, and buffalo skulls on the wall give that authentic ‘John Wayne’ impression. Those travelling on four hooves instead of all - wheel drive can leave their loyal companions in the on - site horse stables whilst relaxing in the swimming pool. The price for this much luxury: around 50 euros per night in a double room. Strangers quickly become friends here. But the ŠKODA Euro Trek has to get going at dawn the next day. On to new adventures. Day two of the journey begins with yet another highlight: the 14 - kilometre - long Lake Siriu dam is picturesquely set amid green forested hills. On the 155 - metre - high dam wall, the ŠKODA Euro Trek participants stop for a short time and take in the spectacle of nature. Adrenaline levels increase 20 minutes later: a suspension bridge with very narrow wooden planks spans the Buzău River – it’s the only way to cross. With folded wing mirrors and delicate acceleration, the 21 muddy companions channel their way through, accompanied by the rhythmic clattering and creaking from the wooden planks. There is only enough time for a quick glance at the beautiful river; concentration is once again on the view ahead. Going slow can be that exciting. 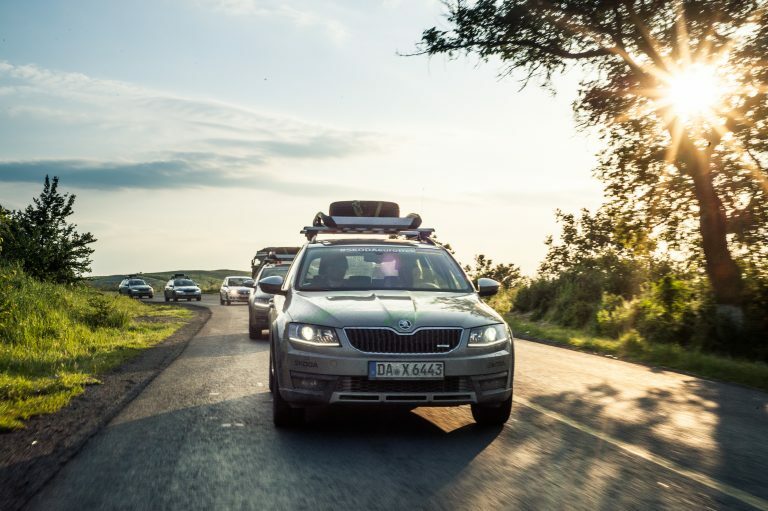 Things go significantly quicker after that: the ŠKODA Euro Trek sets off to the Danube Delta, where Europe’s second - longest river flows into the Black Sea. Whilst travelling on the road towards Tulcea, which consists mostly of dirt tracks, the OCTAVIA SCOUTs take to the road at full gallop. Using the ferries, crossing the Danube is significantly easier than the game of (the suspension) bridge. Day two ends in Dunavăţu de Jos. Here, the participants switch from cars to speedboats and explore the huge river mouth – the beauty of the landscape will leave a lasting impression. The last day once again sends the teams on a journey through time. Along with other interesting spots, the 150 - kilometre - long route leads to the ruins of Enisala Fortress, which sits enthroned high above the vital waterway. In earlier centuries, it was used to control shipping traffic. Today, the Euro Trekkers can enjoy the fantastic view of the Danube Delta from here. OVER THE PAST THREE DAYS, THE 21 ŠKODA OCTAVIA SCOUTS HAVE SUCCESSFULLY COMPLETED A COMBINED DISTANCE OF ABOUT 20,000 KILOMETRES. A little later, the ŠKODA Euro Trek enters the home straight. The adventure finishes at the airport in Constanta. The impressive breakdown statistics after the equivalent of travelling halfway around the world over mostly rough roads: one tyre was damaged. An unforgettable experience in every way.